He seems to especially enjoy the effect that flat abstract spaces create when placed in proximity with semi-representational pictorial elements. 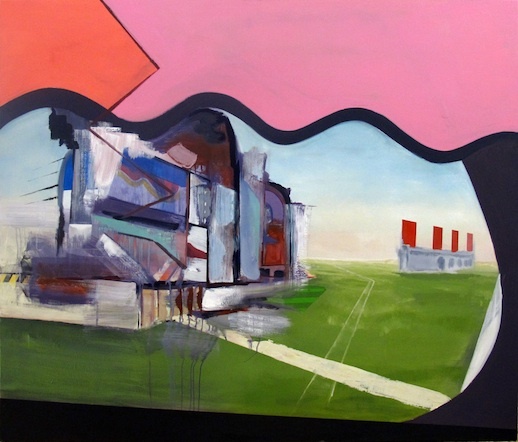 Jonathan Beer "Happening and History"
In “Happening and History” at Kathleen Cullen Fine Arts Jonathan Beer teases the viewer with contrasting juxtapositions that maintain a coherent three-dimensional spatial order, while simultaneously displaying abstracted forms that suggest multiple meanings. His imaginative visions refute boundaries; this is his strength. He seems to have the ability to visualize all manner of opposites within a single context. This characteristic invests his works with unending surprises. 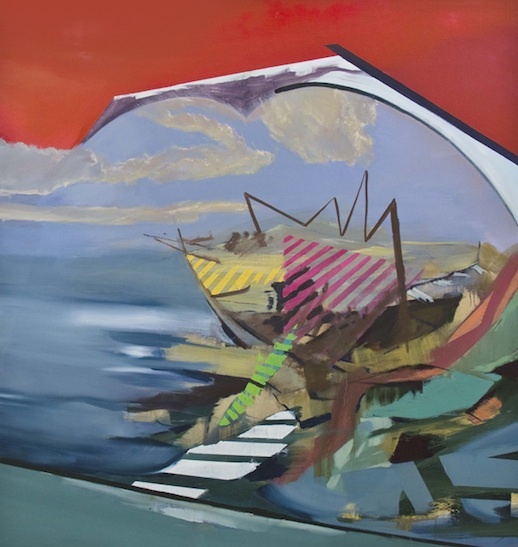 Destruction and creation, representation, abstraction, and abbreviated comic book notations are all part of his playful mix of provocative landscape inspired imagery. Beer resembles a kid with the run of a toy store; one can imagine the feverish fun he experiences as he conjures his rich vocabulary of opposing, contrasting visual phenomena. He seems to especially enjoy the effect that flat abstract spaces create when placed in proximity with semi-representational pictorial elements. In an art world where so many artists are so busy saying so little, it is a surprise to discover an artist who truly has tales to tell. Although he certainly knows how to paint with confidence, Beer manages to make his statements in non-academic tableaux, with free, playful strokes in which the attributes of the medium are respected. The edges he creates are soft and loose, his colors are varied and dynamic. He isn’t a control freak, by any means. In his painting “Separated at Birth,” bright flat fluorescent pink stands with stronger orange, against a sea of watery looking green grass. In the piece “Foreign Window,” Beer establishes a quickly brushed structure that inhabits a pothole-like opening. The visual experience induced by the blurred forms resembles the experience of a spectator in an airplane or a speeding car, who looks out the window at the swiftly receding landscape. These glimpses conjure undefined narratives that suggest dream iconography perceived in the light of day. Abstract interpenetrating brush strokes laid over the blurred shapes take views out of the present moment’s context, thrusting them back into the pictorial space, on a rapidly receding timeline. Beer’s work is all about experiencing life to its fullest. He seems to barely have a chance to map out his present work, before he invents more images, atmosphere, and abstract structures, informed by intuitive leaps of faith. The artist is a major risk taker, whose assurance allows him to pursue his ideas with no timidity. His skill at painting technique allows him to thrust academic approaches aside, while he employs just what he needs to make his fantasy a reality in paint. Beer immerses himself in his environment; he doesn’t isolate himself. Whether he is in NYC or in Europe, he quickly formulates a pictorial structure to express his inner response to his experiences. For Beer, all things in existence are open to his exploration. In his “global” vision, he is determined to relinquish nothing, to find new worlds to conquer. Beer is drawn to architectural structures and landscape elements; naturalistic and fluorescent colors, but not figures and faces, are all part of his toy-box. His paintings are seriously ambitious. The artist employs striped forms to slow the rapid pace of movement within a number of his works. His one cautionary thought might be a fleeting desire not to repeat himself. Symbolism plays a large role in Beer’s art. His piece “Untitled” suggests a shipwrecked vessel floundering precariously as it manages to remain afloat. The flat comic book-type “frame” set above the dominant sea and sky view sets that image apart, suggesting that the catastrophe may be an example of life’s attempts at humor. In these metaphysical paintings, Beer questions the underpinnings of reality. Beer seems to adhere to the view that reality changes with every moment; his images are expressed rapidly, as if in a perpetual state of flux. Change is the one constant that blatantly informs these challenging works. They have about as much chance of repeating themselves as a volcano.